To the already-lengthy list of unorthodox practices and opinions advanced by investor and Trump adviser Peter Thiel -- including injecting himself with the blood of the young, his thoughts on women and the right to vote, and funding lawsuits against Gawker -- go ahead and add his unusual take on energy and climate change. On Tuesday night at the big energy conference CERAWeek in Houston, Texas, Thiel questioned the restriction of global carbon emissions and advocated against “groupthink,” which he said could lead to misdiagnosing climate problems. He made the remarks during a 45-minute interview with energy analyst Daniel Yergin. "I'm not sure I'm an extreme skeptic of climate change, but I have my doubts about the extreme ways that people try to push it through. Even if climate change is quite as bad as people think it is, if we [fall prey to] groupthink, we're more likely to misdiagnose the problem. Maybe it's methane emissions, and the real problem is eating steak," he said. This isn’t the first time Thiel, a libertarian, has expressed his doubts on the changing climate. His comments are particularly relevant now that he's advising President Donald Trump -- who himself is a climate skeptic. Thiel also sang the praises of fracking, which he said “represents a bigger economic form of progress for our society as a whole than the innovation in Silicon Valley.” Fracking has added hundreds of thousands of jobs in the fossil fuel sector. Thiel didn’t give much insight into Trump’s future energy and climate policies. The new president has said he plans to roll back the Environmental Protection Agency, dismantle the Clean Power Plan, and potentially pull out of the Paris Agreement on climate. Even with contrarian climate views, Thiel has made more investments than many of his peers into energy technologies through his various funds. Those investments also tend to be highly unconventional. His Founder’s Fund firm invested a small round of $2 million into nuclear startup Transatomic Power, through its FF Science fund, in 2014. Founded by MIT scientists, Transatomic Power is designing a nuclear reactor that uses molten salt and nuclear waste as a power source. Transatomic Power recently had to walk back some of its big claims, dealing a blow to its commercialization prospects. Thiel’s Breakout Labs -- which is part of the Thiel Foundation and awards small rounds of funding for research ideas -- gave a grant of $300,000 to a Canadian inventor who’s attempting to harness human-made tornados to generate energy. The company is called AVEtec, and the technology is dubbed the Atmospheric Vortex Engine (AVE). Artificial tornadoes are pretty far out there. They’re on par with solar roadways. 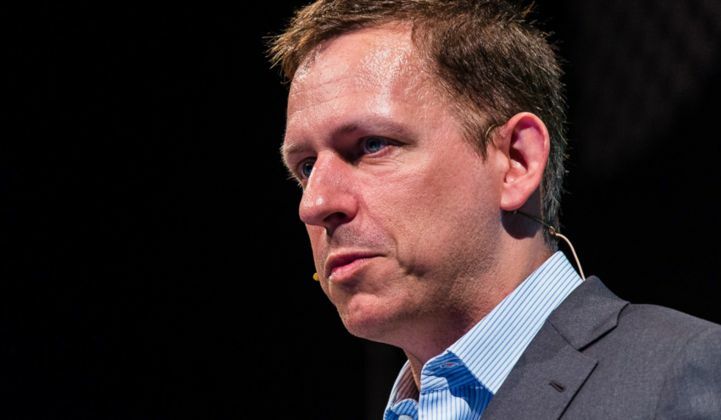 Another unusual energy investment for Thiel has been the Founder’s Fund’s support of LightSail Energy, a Bay Area startup that has talked up its compressed-air storage system. But last year, after not living up to technical claims, LightSail laid off some staff, after raising $70 million in venture funding. Somewhat surprisingly, one of Thiel's investments in climate change adaptation was a pretty big success. In 2012, Founder’s Fund led the series C $50 million round for Climate Corporation, a data company that helps farmers adapt to climate change using insurance products. Ag giant Monsanto acquired Climate Corporation a year after the Founder’s Fund investment for $930 million, making it one of the bigger exits for a company focused on climate change. Thiel gained a lot of attention in 2011 when he called cleantech investing “a disaster” after a string of bankruptcies in the sector. It’s hard to tell where exactly Thiel stands on climate and energy. He's the ultimate contrarian investor -- which probably suits his role as an adviser to President Trump.